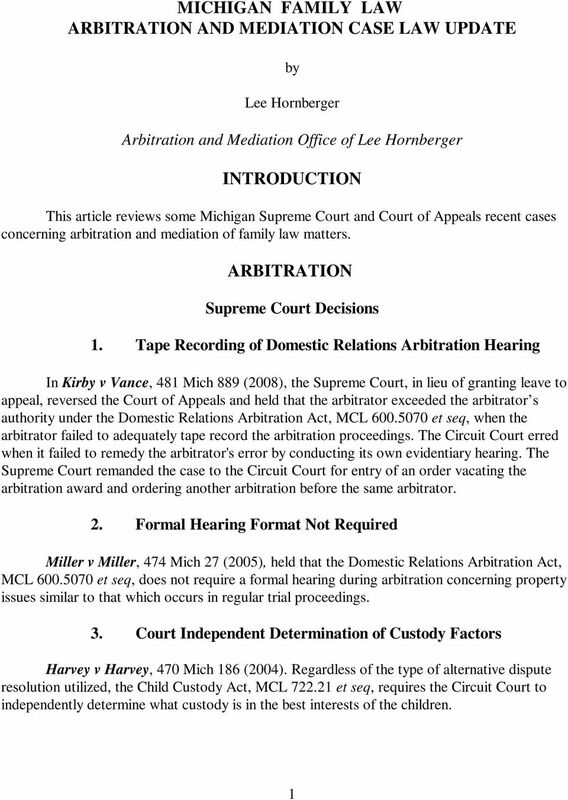 Download "MICHIGAN FAMILY LAW ARBITRATION AND MEDIATION CASE LAW UPDATE INTRODUCTION ARBITRATION"
STATE OF MICHIGAN COURT OF APPEALS ELISE ALICE KALAYDJIAN, Plaintiff-Appellant, UNPUBLISHED September 29, 2011 v No. 298107 Oakland Circuit Court SARKIS RICHARD KALAYDJIAN, LC No. 2007-733434-DM Defendant-Appellee. UNITED STATES COURT OF APPEALS FOR THE THIRD CIRCUIT. Case Nos. 06-2262 and 06-2384 CON-WAY TRANSPORTATION SERVICES, INC. Appellant No. 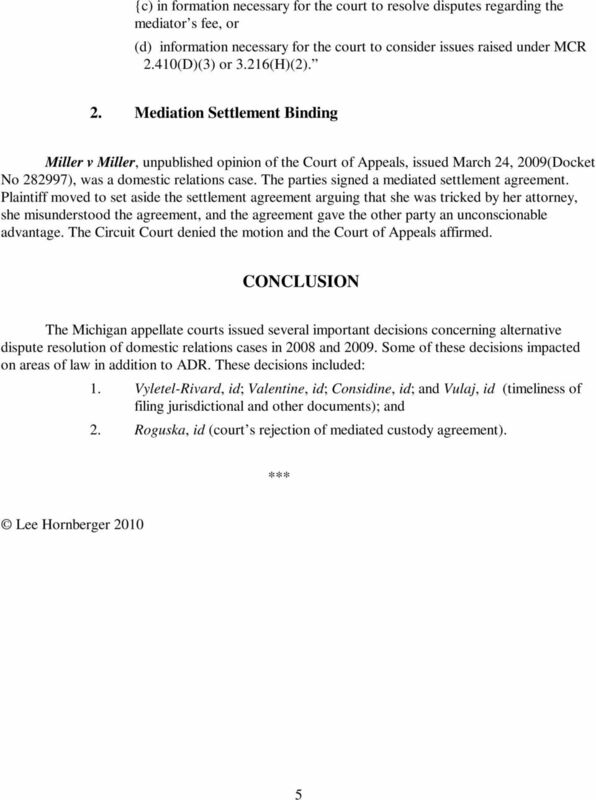 STATE OF MICHIGAN COURT OF APPEALS KEITH M. CAURDY, Plaintiff-Appellee, UNPUBLISHED January 30, 2014 v No. 312247 Lenawee Circuit Court Family Division CATHY JO CAURDY, LC No. 11-036424-DO Defendant-Appellant. 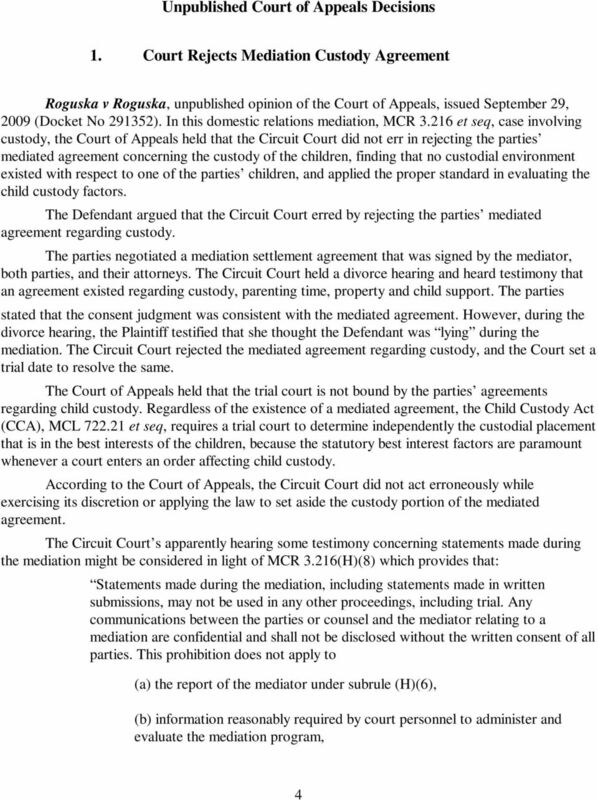 COURT OF APPEALS OF WISCONSIN PUBLISHED OPINION 2005 WI APP 99 Case No. 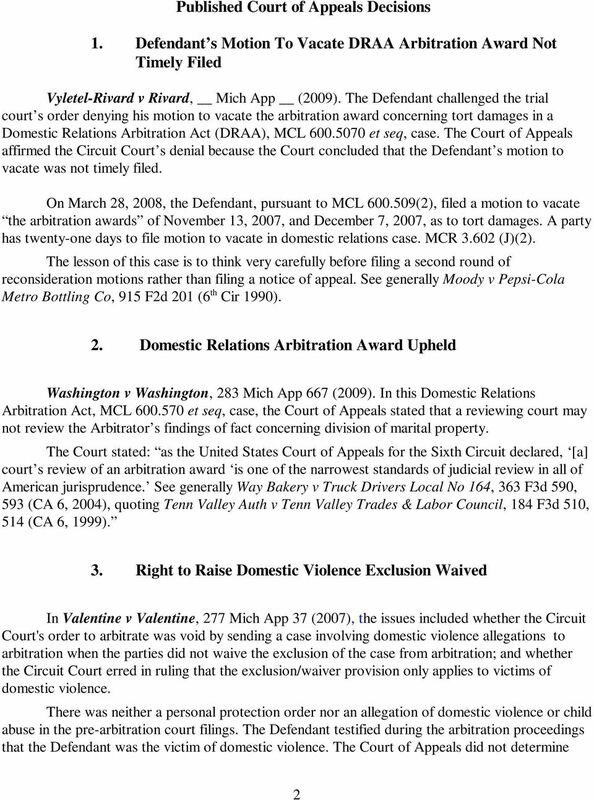 : 2004AP1228 Complete Title of Case: IN RE THE MARRIAGE OF: LINDA HALKO, PETITIONER, STATE OF WISCONSIN, APPELLANT, V. LAWRENCE M.
2016 IL App (1st) 150195-U No. 1-15-0195 NOTICE: This order was filed under Supreme Court Rule 23 and may not be cited as precedent by any party except in the limited circumstances allowed under Rule 23(e)(1). Please find enclosed a double issue of the latest summaries from Recent Developments in Dispute Resolution. 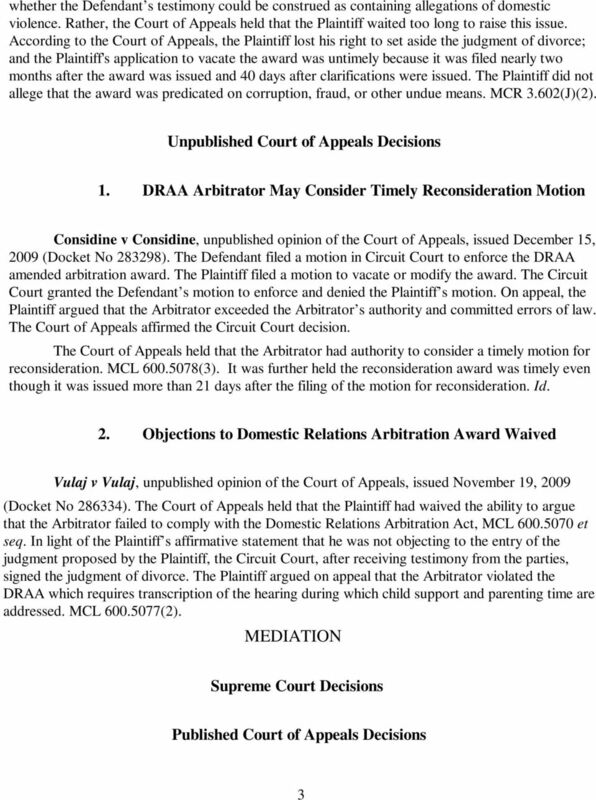 Third District Court of Appeal State of Florida, July Term, A.D. 2012 Opinion filed September 19, 2012. Not final until disposition of timely filed motion for rehearing. No. 3D12-353 Lower Tribunal No. IN THE UNITED STATES COURT OF APPEALS FOR THE ELEVENTH CIRCUIT. No. 14-10913 Non-Argument Calendar. D.C. Docket No. 8:12-cv-01066-MSS-TBM. In re PETITION OF STRATCAP INVESTMENTS, INC. [Cite as In re Petition of Stratcap Investments, Inc., 154 Ohio App.3d 89, 2003-Ohio-4589.